PERFform is a performance art tour of the province of New Brunswick in Canada. This tour is presented by Galerie Sans Nom artist-run centre. PERFform est une tournée d'art performance dans la province du Nouveau-Brunswick, Canada. Cette tournée est présentée par le centre d'artiste autogéré Galerie Sans Nom. PERFform 19 has invited four NB artists to join us on our tour this winter. The plan is to grow performance art throughout New Brunswick, developing PERFform into a strong Biennale. 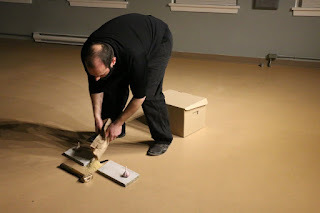 The first weekend of PERFform 19 at Gallery Connexion in Fredericton, Gillian Dykeman joined us, and at Société culturelle Kent-Sud in Bouctouche, Luc Charette performed. Galerie Colline in Edmundston was postponed to February 20th due to weather conditions. Oui, c'est Nouveau-Brunswick en hiver! “Gillian Dykeman’s artistic practice is preoccupied with identity, class, feminism, and utopia. Through performances and installations that tensely operate between parody and sincerity, the artist works to reveal and critique the absurd conventions that sustain a status quo premised on patriarchy, greed, and social insecurity. REVOLUTION REVOLUTION harnesses the amazing energies generated in a room of people focusing together on a demanding task. What is the energy of capitalism? What is the energy of revolution? How do we better engineer our energetic outputs to formulate new ways of being...to radically reimagine what it is we’re doing with our lives? Our life-force? Our love?” This is a quote from Gillian’s website. As the audience joined her in a strenuous physical workout, her statements and questions came to life, framing our participation as a shared desire for change, our bodies striving towards it. Both Mathieu Léger and Linda Rae Dornan created new performances. Mathieu with a poetic work where he placed an unlit match in his mouth and then tried to light it on people’s hands and the wall. The possibility of fire, light, a conflagration between two people, and the desire for warmth was all there. In his next piece several audience members were given white flowers to hold. He then slowly put mini alphabet letters in each flower. The pacing of each of Mathieu’s works was thoughtful and thythmic, no rushing, offering the viewers time to contemplate, be in the moment and enjoy. Linda experimented with two actions—one was stacking book covers into home-like structures and placing a mini LED candle, lit, within each. In her second work, she reviewed files of papers, reading each paper, then throwing or crumpling them on the floor. Meanwhile, a soundtrack of minimal music played, two piano notes translating binary code to text. When the soundtrack finished, she pulled out her iphone and texted someone. Will coding completely replace words on paper? The book cover structures suggested the memory of the words lost, always at home with us. Each work referenced language and knowledge, seen through the lense of technology versus books/paper. There was space in these works for the viewer to bring their own thinking, to expand into often metaphorical images. The next evening, PERFform 19 performed in Bouctouche, joined by Luc Charette. Linda combined the imagery from the previous evening into one longer performance, beginning with the files discarded onto the floor before building the book cover enclosures. When the overhead lights were extinguished, the “books” glowed from within with ghost knowledge you could say. The need to experiment, to “get it right” inspired the rethinking of these works. 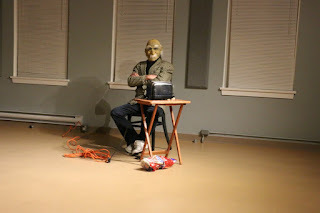 Luc, wearing a full head latex mask of an elderly man, created a character who shuffled out and made toast. The longest making of toast ever! While waiting for the bread to toast, the character moved his chair, the table, rearranged everything, hummed, sang and waited, sometimes with tapping feet. Each toasted slice was placed in a baggy and when he had four of them, he rhythmically stamped them flat before gifting each to an audience member. Each slice of bread had a happy face dug out of it. Through this narrative and time-based performance work, Luc offered sustenance and advice through the eyes of wisdom. Titled, Pour nourrir les oiseaux, it was a gentle laugh at himself, a snapshot of how time is slowly filled post-career (retirement), a sharing of food, and a generous offering to be happy (mimicking the big M’s iconic happy face), revealing layers of social meaning. Mathieu adapted the match performance to the gallery space as one of his performances, again paying close attention to small sounds, gentle movements. In his last performance of the evening, he extended the soundmaking with startling shakes of a cardboard box and its contents. He laid his watch on the floor and a 13 inch long marble plank on top of it anchored with two garlic cloves. A bronze headed hammer came out. Our expectations rose, expecting to see the garlic smashed peut-être. The hammer was wielded in the centre of the marble, smashing it in half, revealing the watch. Mathieu then covered the watch with the mini alphabet letters (pasta). Every gesture was focussed and contained, pulling us in before defying our expectations.